The Staff Selection Commission is to declare the Junior Engineer examination results today. The examination was conducted by SSC to fill out the vacant Civil, Mechanical, Electrical Junior Engineer posts and Quantity Surveying & Contract posts. The examination was performed as two sections. The first section was about the corresponding engineering subject(Civil, Mechanical, Electrical, etc.) and the second section According to the official announcement, the results will be available from 8 PM today. The examination for Junior Engineers was conducted from dates March 1 to March 4, 2017. 3,39,379 candidates wrote the examination this year. Out of 339379 candidates, 133983 candidates were civil engineering graduates,115075 candidates were mechanical engineering candidates, and 90321 candidates were electrical engineering candidates. Marks of candidates who wrote the examination and answer keys will be published soon. Just a few hours left to declare the results of SSE JE. As per the official news from SSC, results will be announced at 8 PM. Just follow the instructions to check the result without any issues. 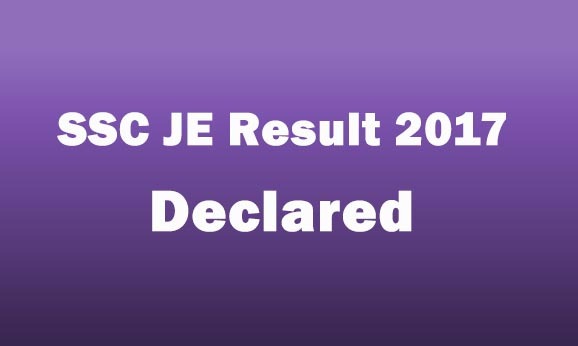 How to check the SSE JE Results 2017? Just follow the steps and get your result fast. * If needed take a hard copy print of the results. The educational requirement for SSC JE is Degree/Diploma in the respective engineering field from a recognized university/institute.